Image supplied by Parliamentary Archives. The test for copyright infringement in the United Kingdom was crucially explored in this controversy that went up to the House of Lords in November 2000. 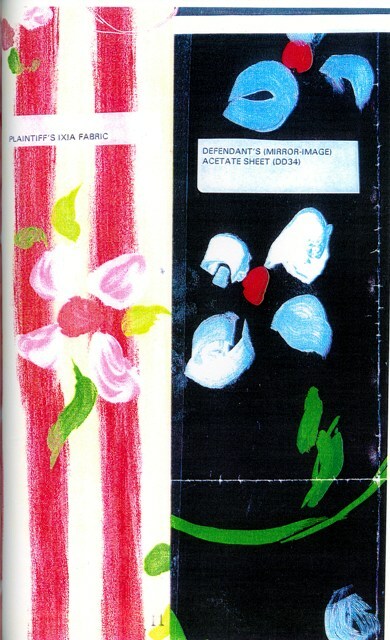 Designers Guild complained that Russell Williams had infringed the copyright of its fabric design (Ixia) when they created - what they thought was - a similar design (Marguerite). At first instance, Lawrence Collins J had found infringement, but on appeal the Court of appeal had reversed. The House of Lords restored the initial finding that there was an infringement of copyright. In particular, the decision discussed the manner in which “non-literal” copying was to be assessed. Interestingly, it was held that the correct analysis was that of a comparison that takes into account the cumulative effect of the copied features. Here we include the visual appendix attached to the expert evidence submitted by the plaintiff to demonstrate the similarities between the designs. For a discussion of the role of expertise in this and other cases, see Jose Bellido “Looking Right: The art of visual literacy in British copyright litigation” Law, Culture and Humanities, 2011.